Portugal Wildfires: Result of Timber Industry? Co-director of Biofuelwatch, Munnion lives in Portugal’s wildfire zone. He said: “We spent last night in a local school after some 30 villages were evacuated in our area. News reports say that a quarter of the municipality has burned. We’ve been lucky so far and still have our home, but many others have lost so much. 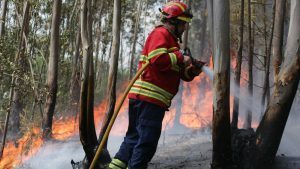 “It’s time to face up to the reality that Portugal’s vast eucalyptus and pine plantations, and the corruption and profiteering that comes with them, are the main reason that the country burns, every year. Coupled with the impacts of climate change, bringing hotter temperatures and drought, our area stands little chance. And the summer has only just begun.